The Open Access version of this book, available at http://www.tandfebooks.com/, has been made available under a Creative Commons Attribution-Non Commercial-No Derivatives 3.0 license. There has been an enormous increase in interest in the use of evidence for public policymaking, but the vast majority of work on the subject has failed to engage with the political nature of decision making and how this influences the ways in which evidence will be used (or misused) within political areas. This book provides new insights into the nature of political bias with regards to evidence and critically considers what an ‘improved’ use of evidence would look like from a policymaking perspective. Part I describes the great potential for evidence to help achieve social goals, as well as the challenges raised by the political nature of policymaking. It explores the concern of evidence advocates that political interests drive the misuse or manipulation of evidence, as well as counter-concerns of critical policy scholars about how appeals to ‘evidence-based policy’ can depoliticise political debates. Both concerns reflect forms of bias – the first representing technical bias, whereby evidence use violates principles of scientific best practice, and the second representing issue bias in how appeals to evidence can shift political debates to particular questions or marginalise policy-relevant social concerns. Part II then draws on the fields of policy studies and cognitive psychology to understand the origins and mechanisms of both forms of bias in relation to political interests and values. It illustrates how such biases are not only common, but can be much more predictable once we recognise their origins and manifestations in policy arenas. Finally, Part III discusses ways to move forward for those seeking to improve the use of evidence in public policymaking. 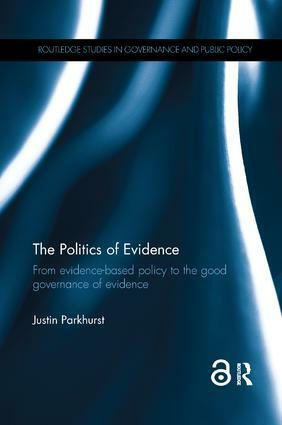 It explores what constitutes ‘good evidence for policy’, as well as the ‘good use of evidence’ within policy processes, and considers how to build evidence-advisory institutions that embed key principles of both scientific good practice and democratic representation. Taken as a whole, the approach promoted is termed the ‘good governance of evidence’ – a concept that represents the use of rigorous, systematic and technically valid pieces of evidence within decision-making processes that are representative of, and accountable to, populations served. What is the ‘good use of evidence’ for policy?